When we have a poor spring banding total at Hilton Pond Center, we usually can rely upon a good autumn and early winter effort to bring up our totals. In 2005, however, the fall migrants never came and the usual big influx of American Goldfinches and House Finches failed to arrive. The result was a disappointing year with only 1,275 birds and 59 species banded--both well below our 24-year averages of 1,940 birds and 71 species. 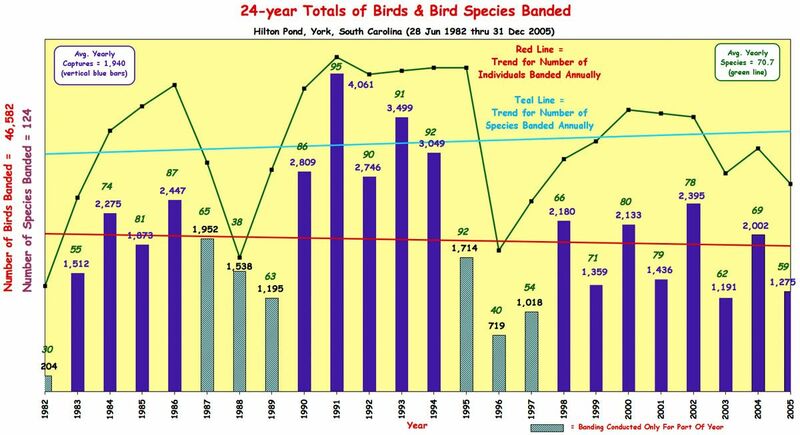 Had it not been for a record-setting showing by Ruby-throated Hummingbirds we might even have dropped below our lowest ever total of 1,191 birds banded in 2003; as it was the 2005 numbers were our second-worst for a complete year of banding since 1982 (see chart below). Curiously, for the past eight years there appears to be an up-and-down trend. Click HERE for a larger version of the above chart. Ruby-throated Hummingbirds were indeed the bright spot of the 2005 banding year; after a slow spring they came on strong in August and September, giving us 226 birds for the year to eclipse the previous record of 210 set just last year. 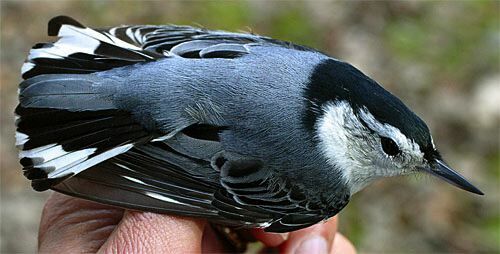 Our population of White-breasted Nuthatches (four banded in 2005; photo below) seems to be growing around Hilton Pond; until this year our previous high was just two. (We've only banded 13 altogether since 1982.) The only other record-high species was Song Sparrow, whose total of 34 equalled the number from 1986 and reversed a 15-year downward trend. We banded an above-average number for just three species this year: Chipping Sparrow (100 birds banded far exceeded the 24-year average of 58), Eastern Tufted Titmouse (14>11), and Eastern Phoebe (11>9). For another seven species we equalled the average number: Northern Parula, Tennessee Warbler, and House Wren (3 banded for each); Bay-breasted Warbler, Hooded Warbler (below), and Louisiana Waterthrush (2 each); and Hairy Woodpecker (1 banded). We captured no species new to Hilton Pond in 2005. Notably absent from our banding table this year were regulars such as Common Grackle, Orchard Oriole, Wood Thrush, Hermit Thrush, Ruby-crowned Kinglet, Pine Siskin, Swamp Sparrow, Cedar Waxwing, and several Wood Warblers--especially Common Yellowthroat. Present but in lower numbers than expected were House Finches (113 banded--barely a third of the 24-year average of 297) and Carolina Wrens (15, under the average of 26; photo below), while Purple Finches (47) came nowhere near last year's record-breaking total of 950. Blue Jays (9 banded this year, compared to an annual average of 21 and a high of 65 'way back in 1983) continue to decline. American Goldfinches, however, rebounded with 374 birds banded--up from last year's 191--and Northern Cardinals showed an increase to 72 after a startling near-record low of 39 in 2004. Several variables probably contributed in part to our low banding totals in 2005. The first week in January we were gone catching hummingbirds in Costa Rica and after our return underwent major retinal surgery that interfered with banding for the rest of the month--usually a productive banding period. Spring migration wasn't very good at Hilton Pond so we missed many warblers; fall migration was an even bigger bust. 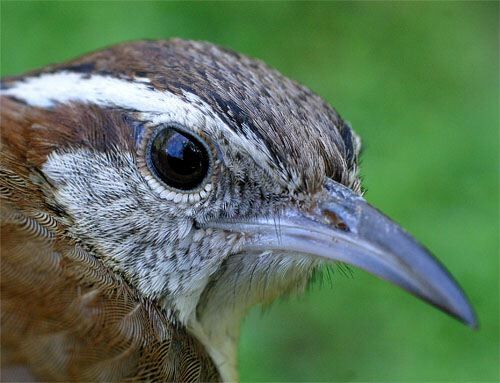 We tokk various other trips away from the Center at various times, including our usual Hummingbird Mornings and a special bird banding workshop we helped lead on San Andres Island in thye western Caribbean. And to close out the year, much-needed rain and/or low temperatures in November and December prevented us from deploying nets--not that it mattered much since few were around anyway during those last two months of the year, and even fewer entered our baited traps. 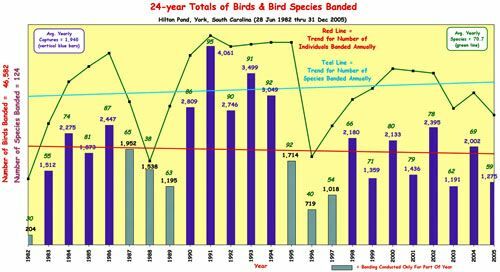 We've mentioned in past weeks our belief there is a real dearth of birds this autumn in the South Carolina Piedmont, and low banding results at Hilton Pond Center bear out our supposition. There's a scarcity of birds in the woods, and they're especially scarce at our feeders. Coincidentally, we heard recently from John Schaust, chief naturalist for Wild Birds Unlimited bird feeding stores; he reported WBU franchises around the country are having normal or above-average bird feed sales--except in the Southeastern U.S. where stores are selling almost no seeds at all. 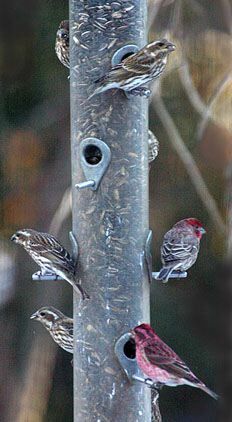 All we can do is keep filling our feeders and keep hoping birds such as House Finches and Purple Finches (above right) will return. We also hope the low banding totals in 2005 were a temporary drop that will rise significantly in 2006 at Hilton Pond. * Individuals have been netted but not banded, per federal Bird Banding Lab guidelines for game birds. --A Cedar Waxwing found dead along the road in from of Hilton Pond Center on 24 Dec had a head injury and bore a fully engorged 7mm tick behind its right eye. We wonder if the tick might have impaired the bird's vision so much that it couldn't detect the oncoming vehicle that apparently brought its demise.